We regret Gallery London (Galleri London) facilit is not accessible to all. Gallery London will gladly arrange slide shows elsewhere if possible. Contact the board. When we invite speakers to the regular program so the room is always available to everyone. Normal opening hours are: Friday 16-18, Saturday 12-15 and Sunday 12-16. At some exhibits extended opening hours, see the current opening hours during each show. Galleri London is located at Fyris plaza (Fyris torg), in central Uppsala. Click for map. Gallery London has exhibits to pass along. Get in touch with caroline@gallerilondon.se. 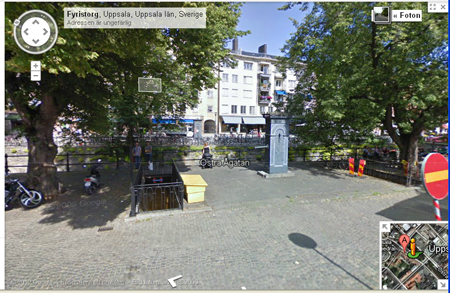 Click on the map to get to http://maps.google.se with a map showing Fyris plaza (Fyris torg).